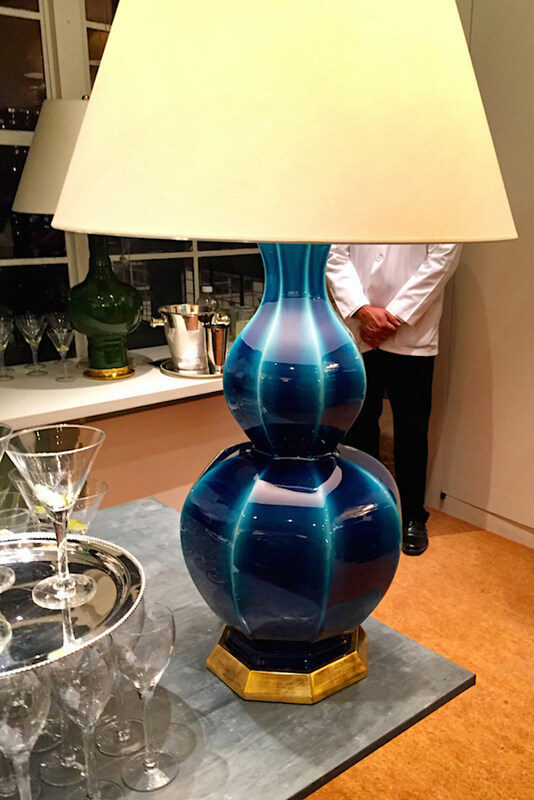 I am constantly tempted by both fashion and decor items I encounter in this shade, such as Christopher Spitzmiller‘s handsome Alexander lamp I spied in his showroom. But did you know that Prussian blue was the link between art and science that truly transformed the world of paint? It’s easy to forget that before the 18th century paint was made from natural sources – plants, flowers, rocks etc. and creating artistic effects in paintings was a much more complicated and expensive matter. Ultramarine, made from lapis lazuli, was the first blue and more valuable than gold. It was an accident in a Berlin laboratory (then a center for alchemy) in 1704 that changed the course of art forever. A chemist rushing to create a batch of cochineal red (made from bugs) accidentally used potash contaminated by (the iron in) animal blood that turned the concoction a deep blue – henceforth known as Prussian blue due to its geographic origins. This new blue pigment, was not only affordable but also stable (colorfast) and became an instant sensation. 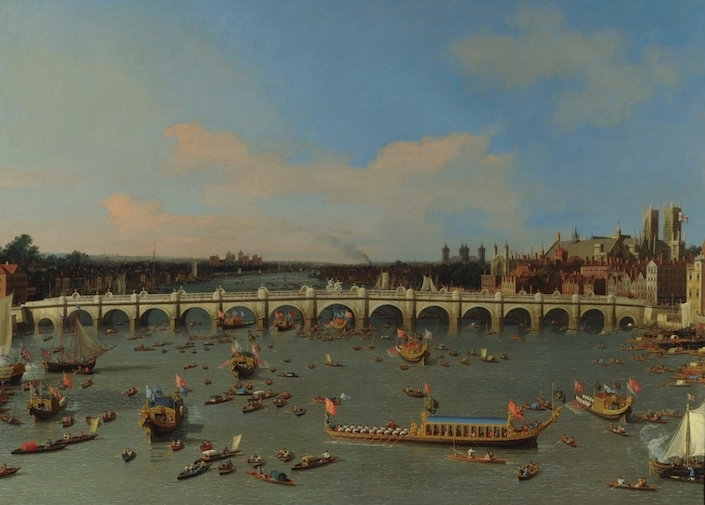 In France, Watteau’s Embarkation to Cythera from 1710, two above, has been documented to contain it and Canaletto was an early adopter in Venice, employing it for his dramatic skies, as in his Westminster Bridge from 1747, above. Demand spread throughout Europe and within a few years it was in factory production – the first commercial pigment, used not just in painting but in flags, postage stamps, clothing (it was the official uniform color of the Prussian army) and tea! But for the art world, this scientific discovery continued to be transformative. 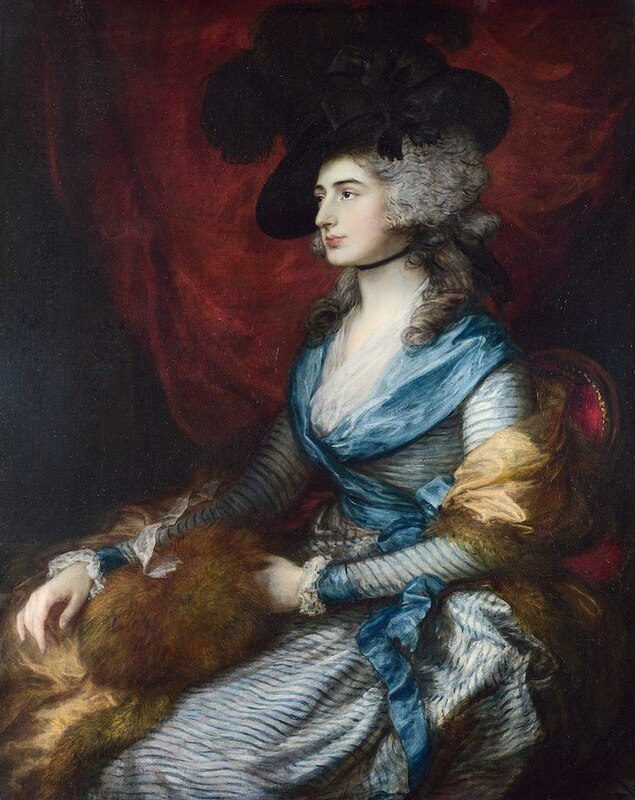 Artists such as Gainsborough (his famous portrait of Mrs. Siddons from 1785 above), Sir Joshua Reynolds and Elisabeth Louise Vigée-Le Brun (finally celebrated with recent exhibits at the Met and Grand Palais), in her evocative portrait of the Austrian, Theresa, Countess Kinsky from 1793, below, all now depended on Prussian blue. But it wasn’t just in Europe that art felt the influence of Prussian blue. Previously using fast fading vegetable dyes or indigo for blue, Japanese artists found the new pigment revolutionary. 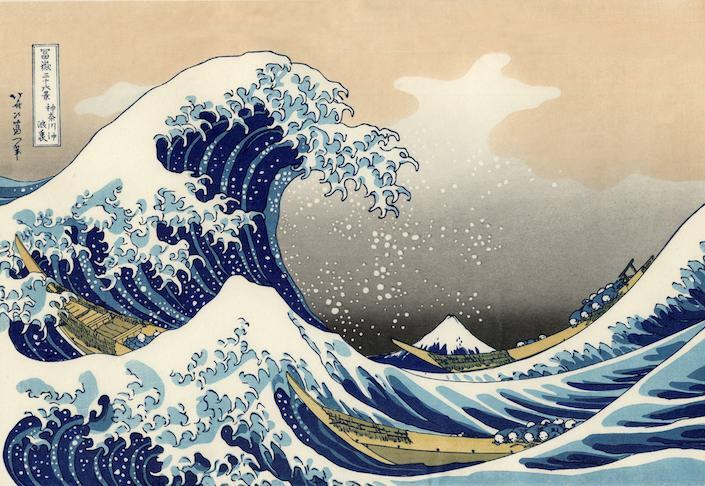 Hokusai’s famous Great Wave off Kanagawa, from 1830, for example, used the new Prussian blue, in combination with the traditional indigo, to great effect. And it all came full circle when the European artists saw Hokusai’s prints at the Japanese pavilion during Paris’s International Exposition of 1867. 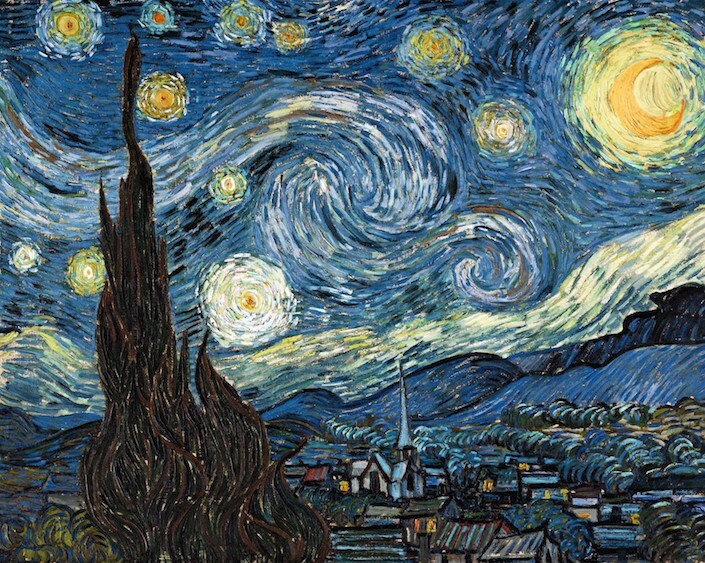 Van Gogh’s Starry Night, 1889, below, reflects the impact Hokusai’s shapes and use of Prussian left on him. Prussian blue’s prowess continued into the 20th and 21st centuries as modern masters from Picasso to Damian Hirst depended on it as well as the world of science where it is used for radiation poisoning! 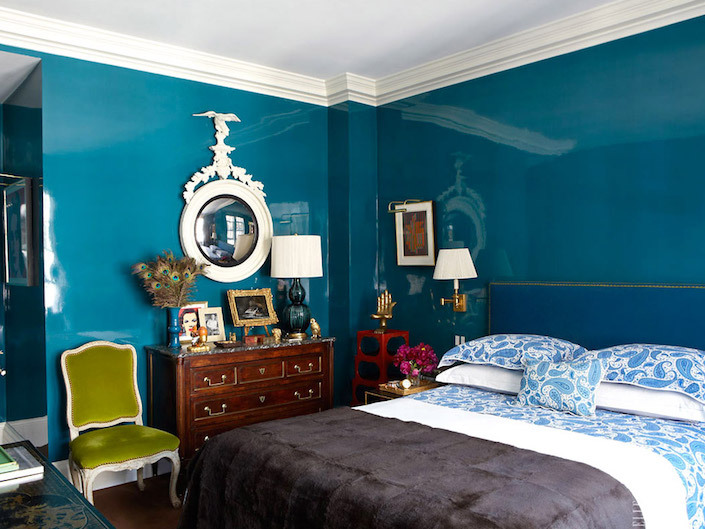 So next time you are lusting after an item or room in Prussian blue (like Todd Romano‘s chic lacquer bedroom below – with Chris Spitzmiller’s Delft lamp), you can remember its powerful influence and how it is one of the many links between art and science. 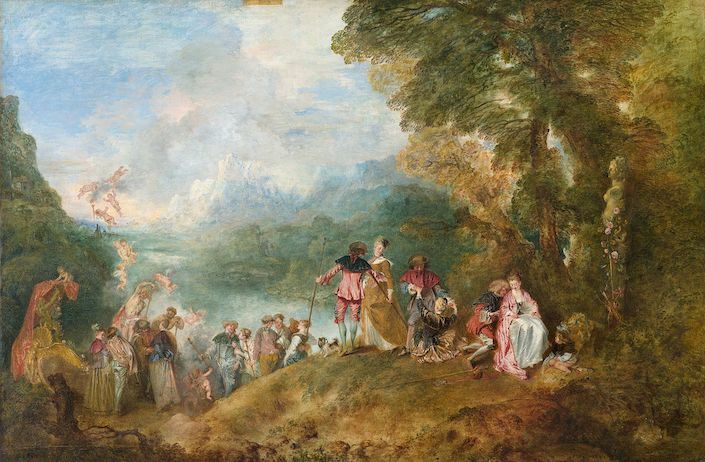 This entry posted in art, art history, interior design, learning. 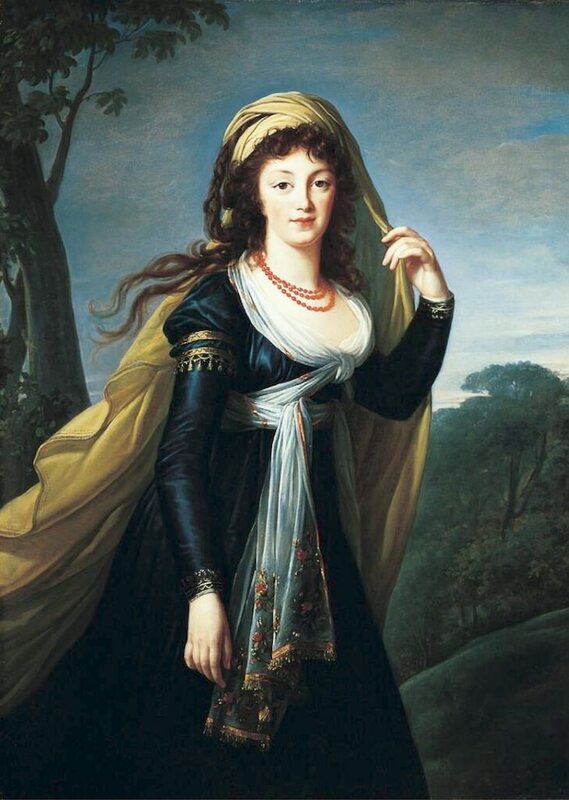 Entry Tags: art, art history, color, Prussian blue Bookmark the permalink. Thank you for sharing about this fabulous antique & garden show in Nashville. My only sadness is that it wasnt shared several weeks ago…as I would dearly loved to have attended. The roster of speakers & the books they will share & autograph is truly amazing. As a faithful reader of your blog it would have been delightful to see you. The antiques show I am sure will be fabulous too! Thank you so much for this….. I love each and every post you do sharing the world of design with us, but this is my favorite…. I so love art history and this gives me new appreciation for both some of my favorite paintings and rooms! Levi Strauss used Indigo. Indigo is a plant dye that needed to be used with a mordant. It is not colourfast and therefore ‘fades’. Prussian blue is considered the first modern synthetic colour. Look it up and read about it. It has vey interesting history and applications. Actually indigo doesn’t need mordants! Susan is correct. Indigo is a substantive dye which binds so well naturally with cellulose fibers such as cotton that they do not require mordants. Blue comes from many sources and it’s possible Levi Strauss may have used Woad instead of Indigofera due to availability and price. Many natural dyes such as indigo are colorfast, however not as colorfast as synthetic dyes. That being said, many old jeans are prized for their ‘faded’ look and softness. Fucshin was the first synthetic dye accidentally ( again) discovered in 1859 by Perkins. It was not lightfast and turned to a pale grey within a decade or so of its application. It become a sort of marker in dating antique oriental rugs. No mordant is used with indigo. It is a vat dye that require a strong alkali (for a high pH) and a reduction ingredient which reduces the oxygen in the vat in order for the indigo to go into solution. If a thick cotton (like denim) is dyed with a relatively lower pH then the indigo will not absorb well and will tend to deposit more on the surface. When this happens, the indigo can be mechanically worn away (as with wear, abrasion, and vigorous washing), giving the appearance of ‘fading’, but it is in fact lightfast and does not fade. The wearing off of indigo makes for the “Blue People” As the Ashanti, nomadic tribe of the Sahara are known. Love Prussian blue – use it in my skies – it makes that nice strong “Blue Hour” intense, magical feel. I meant the Tuaregs are the “Blue People” Goodness It’s 3:30 AM Sorry! What a wonderful and informative post…thank you for educating us thru so much beauty. Blue has a new meaning for me now! Thank you! I didn’t know this about blue. I will forever look at blue with a new respect. Prussian Blue is one of my favorite choices for upholstery as it can be a great neutral. Thank you (again). Fascinating! One of my favorite colors too, and now I know it even better! Thanks you! The color also was worn by the Prussian military and King Frederick William I of Prussia, the father of Frederick the Great, would wear his simple uniform at court making the fashion and color very popular. It even has medicinal uses. Fascinating, beautiful, informative and enlightening …. thank you Stacey!! Great (and very informative) post! Thank you! That was so beautiful and informitive. Thank you. Enjoyed this blog. Will revisit. Marvellous post Stacey–instructive, and engagingly expressed! I use Prussian Blue ink exclusively in my fountain pens. You might know it by a different name: laundry bluing. That’s right, Mrs. Stewart’s Concentrated Liquid Bluing is virtually identical to early Prussian Blue ink recipes. Prussian Blue is not only the first synthetic pigment, it has the second smallest particle size after carbon black, and flows easily through fountain pens without clogging. It is extremely well-behaved on even cheap paper stock, lightfast, permanent, archival, and waterproof, in addition to offering the most beautiful blue colour and being extremely inexpensive. And you can still use it in the laundry and in your hair. Very interesting! Thank you for sharing this info! I believe I once read that burning Prussian Blue would produce toxic cyanide. Ever since, I’ve had the seed of a whodunnit in my head: artist (who uses a great deal of Prussian Blue) is hated by someone who sneaks in and burns all his paintings. The deed kills the perpetrator via the cyanide that results. I’m surprised no one mentioned that indigo was an important product in the Colonial and US slave trade. Quaker abolitionist John Woolman refused to wear any fabric died with indigo. So now I know that Prussian Blue, one of my favorite colors, also may have helped a little to discourage the sale of slave produced products. I burying iron nails in the soil around my hydrangeas to make them blue. I did know the science behind it, I just enjoy the results! Vincent is a very favorite. His later skies keep me captivated!! How kind of him to illustrate your work. He was good enough to let me use him in my psch papers too. In terms of its tone, how different is Prussian Blue from the ‘Muslim Blue’ used in Chinese ceramics? As I understand it, the Chinese blue and white pottery dates from about 1000AD, when Chinese traders in the Middle East were selling their pottery, and the local people having a love of the colour blue, asked for it in that colour, and gave the traders the cobalt that they were using to dye other things. They brought it back and applied it to their pottery (and later porcelain? because it was about that time that they developed porcelain) and henceforth it became known as ‘Muslim Blue’ in China. Prussian blue would NOT produce a blue colour of fired on ceramics – probably a dirty red as it would end up as iron oxide. Cobalt has the advantage that, though the colour may change depending on the firing conditions, it will always remaiun blue. This was a lovely article! If you haven’t read it, you might really enjoy Sacre Bleu by Christopher Moore. It’s all about blue and art history. I am very fond of Prussian blue but the best colors in the world were not invented. Visit India! Afghanistan – see the fields of wild poppies. Those colors are real not invented. Your article was interesting at any rate. A favourite of mine also. A fascinating story is “A Perfect Red” the history of colour. It was also worth more than gold because it was made from cochineal. I’ll say no more. Amy Butler Greenfield is the Author. I read that some French pigment retailers in the late 1800’s refused to deal in Prussian blue following the Franco-Prussian war. Does anyone know if there is truth to that? I think I read that in a historical novel. So glad a friend sent me the link to your blog. Wonderful article on Prussian Blue. I am an independent quilt historian and love learning all I can about the history of color in textiles. Another fascinating book I read this past year about blue was Baruch & Judy Sterman’s “The Rarest Blue: The Remarkable Story of an Ancient Color Lost to History and Rediscovered”. Thank you for this interesting read. I wish you had included an Indo-Persian painting image too as Indian and Persian miniature paintings are known for the use of blue. Wonderful post Stacey! Prussian blue is my favorite color! 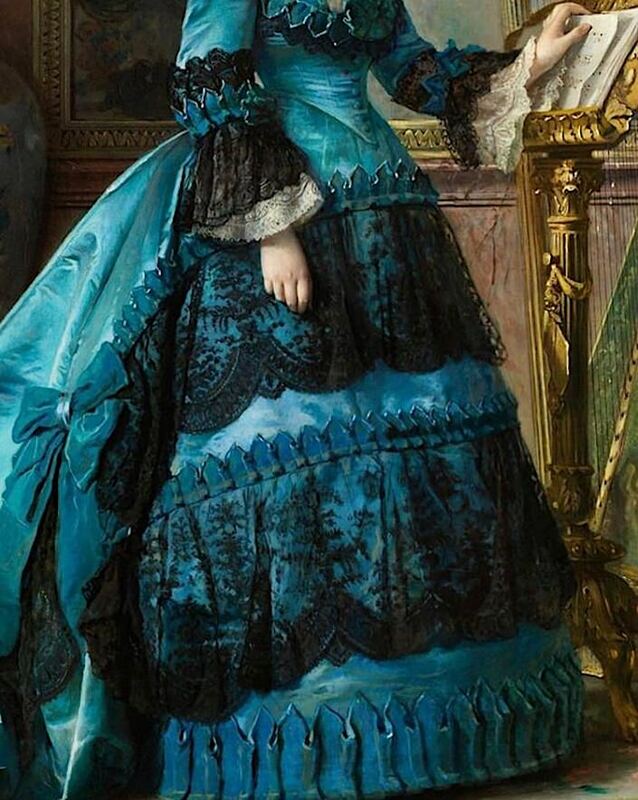 Honestly curious: was Prussian blue used that prolifically for clothing and textiles, or was it artistic license on the part of these painters to use it to depict the clothing of the wealthy? I’m afraid I don’t know the answer to that question Arlee. I do know it was used for clothing prolifically I can’t say . So many interesting points . Thank you! I didn’t understand this regarding blue. I will be able to forever look into blue with a replacement respect. Prussian Blue is one in every of my favorite decisions for upholstery because it is an excellent neutral. I also read a about blue pottery, must read it(because of its relevancy) : https://www.iicd.ac.in/rajasthani-blue-pottery-a-seer-in-blue-in-the-pools-of-white/. I just love the art you explained. thanks again. Thanks for that eye-opening lesson of the importance of the blue color. That lovely artwork helped in bringing home that beautiful historic point. Wow! What an amazing post! Thank you Amanda – glad you enjoyed! 89 queries in 0.897 seconds.